Intel's New 4th Generation Intel ® Core™ i7 4790 offers superior performance over the previous generation processors. This astounding performance boost results in performance improvements in multi-tasking, encoding, gaming and multithreaded applications. Intel's 4th generation processor has improved PCI-Lane 3.0 bandwidth which helps further boost performance of latest generation 3 graphics cards for the ultimate gaming experience. For overclocking enthusiasts, Intel's 4th gen CPU has improved memory overclocking support, with up to and beyond 3000MHz possible with the very best memory kits. Memory bandwidth is critically important to Haswell compared to previous generations. High frequency memory performance significantly improves encoding, gaming and benchmarking tasks. The biggest leap in Intel's Haswell processor is the onboard graphics which is now up to 2.6x faster than previous HD4000 found in the Ivybridge CPU. Dynamically increases the processor's frequency as needed by taking advantage of thermal and power headroom when operating below specified limits. 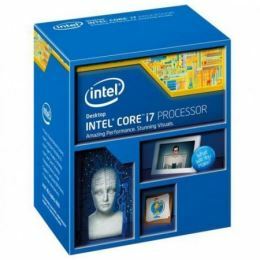 Intel Core i7 delivers two processing threads per physical core. Highly threaded applications can get more work done in parallel, completing tasks sooner. Enhanced 3-D1 performance for immersive mainstream and casual gaming. Can support up to three UltraHD* (4K) displays and collage display. Wirelessly stream HD / 3-D video and games to your TV or projector for presentations and entertainment. Delivers fast conversion of video for portable media players, online sharing, and video editing and authoring. Stereoscopic 3-D Blu-ray* playback in full 1080p resolution over HDMI* 1.4 and premium audio. A set of new instructions to improve software performance for floating point-intensive applications such as audio processing, audio codecs, and image and video editing applications. An integrated memory controller offers stunning memory read/write performance through efficient prefetching algorithms, lower latency, and higher memory bandwidth. The shared cache is dynamically allocated to each processor core, based on workload. This significantly reduces latency, improving performance. New AES instructions add hardware acceleration to AES algorithms and speeds up the execution of AES applications. Includes a four-pin connector for fan speed control to help minimize the acoustic noise..